MyRepublic has launched three new mobile plans which looks to showcase the telco’s “simple and worry-free” philosophy. Speaking to Marketing ahead of the launch, Shivendra Singh (pictured), CMO of MyRepublic, explained the brand no longer views itself as a “challenger” in the telco space. Instead, it sees itself as an incumbent which already disrupted the market one year ago. Singh added that as such, a strategic brand refresh is as such currently underway to help unify and create a single MyRepublic brand “template” which allows marketing teams in each different market to refer to when executing their marketing campaigns. “We already have a certain momentum in the market – with a customer base reaching over 70,000 households, translating to almost 375,000 in customer reach,” Singh explained. The same goes for the brand’s regional expansion, which has since seen its user base grow in markets such as Australia and Indonesia. The refresh also banks on the brand’s core values are of sincerity, long-term sustainable value to the customer and reliability of experience. This is something which will also extend to its promotions and branding for its mobile services, which aims to be sustainable, practical and easy to use for the next 15 -20 years. “We’ve got a certain top of mind in the Singapore market, and we are going to be using that to build our mobile offering. That is what we have already started, part of the change would be building on those core values and to expand our marketing,” Singh added. We are not that young kid next door anymore – we are more of a young adult. In fact, the MyRepublic brand is a practical one which appeals to tech-savvy young adult, who are the brand’s most important and often repetitive segment. Currently, the brand finds itself to be popular with the “newly-married” household segments. These are the consumers which resonate with the brand – the ones which desire practicality and mobility, he explained. We are not a brand that is ever going to be in hyperplay, we are not going to make tall claims, or big sweeping statements because we don’t have to. “We believe our world is the world of word of mouth advocacy,” Singh said. He added that the brand already has a huge amount of advocates and as such, those are the consumers the brand will be looking at. Singh is also of the view that consumers and brands are currently in the best time to create that word of mouth advocacy as the ability to customise right now for marketers is phenomenal. This can be seen in MyRepublic’s new mobile plan launches, which also have a special focus on existing customers of MyRepublic’s internet services. Around a month ago, MyRepublic unveiled its first mobile plans – Uno and Ultimate – which were exclusive plans only available to registered supporters of its mobility bid and broadband customers. This was important for the brand to keep its promise made to existing supporters and provide value. Yesterday, the brand also launched a spot for its #BreakFreeofMEH campaign which pushes its new mobile offering. Moving forward, an expansion in MyRepublic’s marketing is definitely coming along with a continued focus on being digital-first. 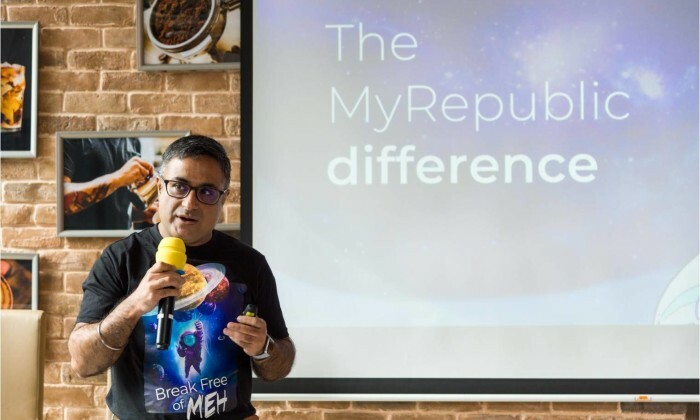 Singh added that this does not mean that MyRepublic’s marketing will suddenly become a large multi-million dollar account. This is because it believes that in the space it operates in, it does not need to be. “10 years ago it was very important but today, especially in markets such as Singapore, you don’t need that. What you need in the space of personal technology is to have a person-to-person connection,” Singh explained.